Welcome to the ultimate online resource for busy real estate professionals looking to make a splash on social media. Whether your past, present or prospective clients are buying, selling, renting, financing or renovating a home, you’ll find expertly-written articles on For Sale Guides with all the information and inspiration they’ll need to help them on their real estate journey. How can you make the content on For Sale Guides work for you? Enter Post Café, a groundbreaking social media service that keeps your brand active on social media. 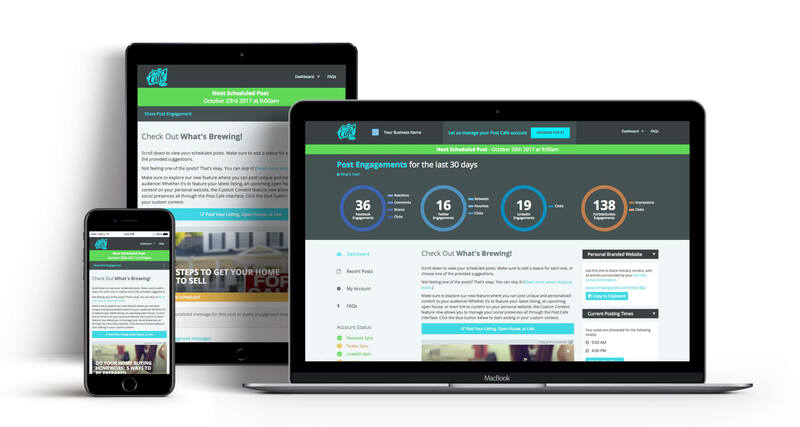 Sign up for Post Café, and we’ll post the quality content you find on For Sale Guides directly to your social media accounts on Facebook, Twitter and LinkedIn. Finding relevant, engaging content to grow and enhance your client relationships can be a full-time job. But it shouldn’t be yours. Learn more about what Post Café can do for your real estate business.